We are always searching for innovative, headstrong HBO /WO-level employees with a good sense of humor! One of the best opportunities to be visible for and get in touch with excellent students and professionals is our own Technical Challenge. The participants have to face a challenging case about the development of a machine in the field of high-tech production automation in the automotive industry. In addition, it offers students and professionals from the industry with a (HBO/WO) technical background a unique chance to actively engage in our process of finding solutions for production automation challenges. Last week IMS organized for the 4th consecutive time a Technical Challenge. Our presence at the ‘Bedrijvendagen Twente’ in February, and through a registration form on our www.werkenbijims.nl website, we have enabled the participants to register for this Technical Challenge. 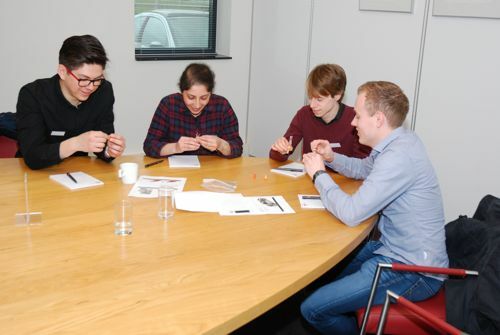 On March 28th an enthusiastic group of 13 persons came to IMS to participate in the Technical Challenge. We started the afternoon with a walk-in (including lunch), company presentation and an introduction tour through our company. Followed by the presentation of the case. The participants had to work closely together in a multidisciplinary team to unravel a challenging case about (fine) positioning in a high-volume automotive production line. Divided into three groups, the participants worked through the first phases of an IMS project: specifications, proposal(s) and concepts etc. were discussed in detail. Within a very short time frame, one and a half hour, the groups needed to come up with their solution for this case and present it to the rest of the group. After the presentation there was time for questions and a short break with feedback from the jury. In the first place, we’d like to thank all the participants for their enthusiasm, creativity and their participation during this day. We’re very particularly proud of the rise. Good to see all participants had a proactive attitude. Where someone took the lead, someone else defined different process steps on the whiteboard. Where one group presented one specific solution in more detail, another group presented an overview of their creative process including morphologic overviews, selection criteria and recommendations for next steps. 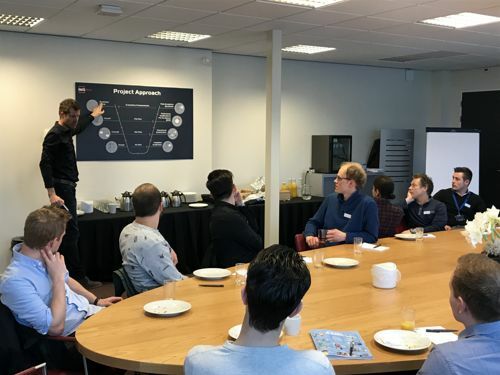 At the end of the day, the IMS engineers were very pleased with the number of creative concepts and inspiring talks during the network event afterwards. Our Technical Challenge is an excellent opportunity to get to know IMS and to find out what challenges we face! Are you interested participating our next Technical Challenge? Keep an eye on our website www.werkenbijims.nl or follow us on LinkedIn!